A UNESCO World Heritage Site since 2002, the Alto Douro wine region is a wonderful place for those who wish to delight in an excursion and be delighted by a landscape that is truly unforgettable. For that matter, nothing like a trip on the Douro River, from the interior of the Portuguese countryside to its coast, where the historical city of Oporto waits for its first time or returning visitors. In alternative, the same distance can be travelled and explored, totally or partially, via train, bus or car. Whatever means of transportation is chosen, the experience will remain forever etched in the minds of those who have travelled it. 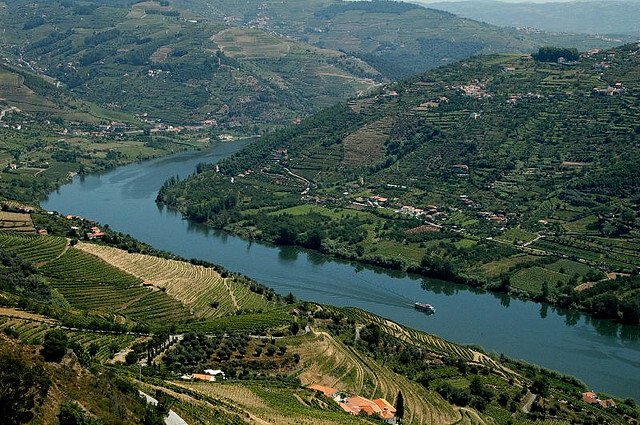 Travelling down the Douro River by boat is the most popular type of tourism in this region. The cruise, besides being very serene, is also fun and educational – as it explores the importance of the wine production process in this region and whose destination city confers its most famous brand name – Oporto Wine. Flanked on both sides by countless kilometers of vines, the Douro River is rolled out like a blue carpet, elegantly showing off its unique history and culture. The pleasant rhythm of the trip is perfect for taking memorable photographs or simply enjoying a great conversation. The departure point can be one of three different spots: the Régua Pier, the Pinhão Pier or the Pocinho Pier, depending on the type of boat cruise you wish to take. The type of service that characterizes these cruises normally includes lunch and may sometimes include a welcoming drink – which is always comprised of a magnificent wine reserve. The duration of these boat cruises varies between 6 hours (if the departure is from the Régua Pier), 8 hours (if the departure is from the Pinhão Pier) and 12 hours (a 2 day cruise that departs from the Pocinho Pier). Although not as popular as the boat cruises, it is worth noting that this trip can also be enjoyed aboard one of Douro’s historical trains, which maintain a strong connection with the region – there is even a train reserved especially for tourists. Travelling along 200 kilometers, this historical train ride through the Douro recreates what this region was like in the beginning of the 20th century, with vintage engine and carriages included! The train trip between Tua and Régua takes about one hour, and is made possible either by vapor or diesel, depending on the time of year and weather conditions. Either by boat or train, both are great opportunities for snapping pictures while whizzing by the river’s waters and taking in the fantastic landscapes that the Douro’s wine culture has to offer. As a last alternative, this trip up the Douro River can also be done by car or bus. However, because some of the main attractions are lost, these must be substituted by other activities that will make this road trip equally worthwhile. And the best way to do that is to stop at some of the many local farms whose doors are open to the public, so that those who are interested can see up close how the magnificent Douro wine is actually produced. Some wine tasting and the purchase of a couple of bottles as souvenirs to take and enjoy at home complete an unforgettable day.